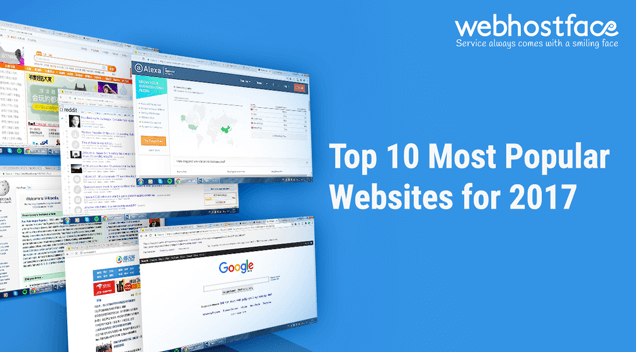 Recently we derived a list of the 10 most popular websites in the world for 2017. The list we compiled is based Alexa.com stats, a site which tracks millions of website users to create lists of the most visited websites by country and globally. Alexa’s rankings are created based on the estimates of the daily time spent on site per visitor, daily page views per visitor, % of traffic per search and the total number of sites that link to each website in their list. Taobao (www.taobao.com) – initially launched in May 2003, is the most popular consumer-to-consumer (C2C) online marketplace in China. The website attracts Chinese consumers who value the platform’s wide range of products and services and their price competitiveness. With around 760 million product listings as of March 2013, the site was reported as the China’s largest online shopping destination in terms of gross merchandise volume in 2013, according to iResearch. Currently, Taobao Marketplace business is part of the Alibaba Group. According to Alexa, Taobao is ranked globally as number 10, however, it is ranked as 3rd most popular website in China. As you can see from the chart below and a research of the World Economic Forum the website also attracts users from Japan, South Korea, United States and Hong Kong. The average user spends 8:52 minutes on the site and visits around 4 pages. The bounce rate is 15.40% and there are 53,690 sites linking to Taobao. Founded in November 1998 by Tencent, Qq.com count their total users at over six hundred million. With the strategic goal to provide their users with “one-stop online life service”, the website offers a wide variety of services, ranging from instant messaging, mail, search engine, shopping, and even online dating. The diverse Tencent platforms – QQ, QQ.com, QQ Games, and PaiPai.com form China’s largest Internet community. Linked up with other heavily used features such as forums, chat rooms, and QQ Groups, Tencent’s Qzone has grown into China’s largest personal Internet space, with almost 1 billion users on QQ Instant messenger. In addition, the Qq virtual products – QQ Show, QQ Pet, QQ Game, and QQ Music/Radio/Live also successfully manage to provide entertainment and customization options to their users. Ranked number 9th by Alexa, Qq.com is also the 2nd most popular website in China. And although 92.3% of the visitors come from China, just like Taobao, the site also attracts users from Japan, South Korea, and the United States. Normally the average visitor spends 4:38 minutes on the site and sees around 4 [promptly 3.91] pages. However, compared to the other Chinese website on the list Taobao, Qq has almost double bounce rate – 31.10%. Reddit is an American social news aggregation and discussions website with an incorporated content rating system. It was founded by the University of Virginia roommates Steve Huffman and Alexis Ohanian on June 23, 2005. Every user can post stories and links on Reddit, with topics covering everything that is new and popular on the internet. As of 2017, Reddit had 542 million monthly visitors and 234 million unique users. Although Reddit is globally ranked number 8th by Alexa, the site is rated as the 4th most popular website in the United States. While over half of its users come from the US, the website attracts visitors from the UK, Canada, Australia, and Germany, too. An interesting stat is that the average user spends the longest time (15:53 minutes) on the site, compared to the rest of the websites that are ranked in the most popular top 10. The average Reddit visitor views about 10 pages [10.38] and the site has a bounce rate of 25.50%. This is an Indian version of Google.com. It is made to search the whole web or only webpages from India. The number 7 position of Google.co.in in the Alexa global ranking proves the fact that the majority of internet use is driven by the search for information. Google.co.in provides interfaces in English, Hindi, Bengali, Telugu, Marathi, and Tamil. On average the users spend 8:06 minutes on the site, and view approximately 11 pages [11.12]. A curious fact is that the bounce rate has fallen by 12% versus the previous 3 months – estimated at 27.60% now. Yahoo is one of the pioneers in the top 10 most popular websites in 2017 rating. It is the oldest and the second most visited search engine on the web. The site was founded in January 1994 by Jerry Yang and David Filo, electrical engineering graduate students from Stanford University. They created a website, named “Jerry and David’s Guide to the World Wide Web”. Apart from its globally recognized web portal, search engine Yahoo! Search, the site provides a lot of services, including Yahoo! Directory, Yahoo! Mail, Yahoo! News, Yahoo! Finance, Yahoo! Groups, Yahoo! Answers, advertising, online mapping, video sharing, etc. There are 700 million active monthly users on Yahoo. However, in the era of Google and Facebook, the website is facing difficulties to make its positions in the list. When it comes to stats, the site is ranked number 6th globally and in the US, with a substantial number of visitors coming from India, Taiwan, Indonesia, and Brasil. The Yahoo users spend around 4:05 on average on the site, and view approximately 3 pages per visit [3.79]. The bounce rate of the site is rather high, estimated at 46.70% by Alexa. Wikipedia is a free online encyclopedia. Initially launched on January 15, 2001, by Jimmy Wales and Larry Sanger, the website is today’s largest and most popular general reference work on the Internet. Since Wikipedia is a free website, you can find millions of articles in 287 languages there (according to otechworld.com – 45 million pieces) and they are open to being edited by everyone on the internet. Currently, the website Wikipedia is owned by the nonprofit Wikimedia Foundation. As you can see above Wikipedia attracts most users in the US, followed by Japan, India, China, and Germany. The average visitor sees about 3 pages [3.27] and spends 4:11 minutes on the site. A prominent stat is that 68.40 % of visits to the site come from a search engine. Launched on January 18, 2000, Baidu is the Chinese language search engine and the most visited website in China. It provides “simple and reliable” search experience in Chinese, including a search of multi-media content – MP3 music and movies. What is more, the site was the first to offer WAP and PDA-based mobile search in China. Apart from being the most popular Chinese language search engine, similar to Qq.com, Baidu also provides over 50 other services. On average the visitors spend 7:54 minutes on Baidu and view 6 pages [6.31]. The popular social networking site was started by Mark Zuckerberg in his college dorm room at Harvard in 2004. Since then, it has grown to serve over one billion users worldwide which makes it the most powerful tool for finding people online. Similarly to Twitter, Facebook has helped to assemble and organize communities involved in protests and demonstrations all over the world. There is no limit to the popularity of this site. According to Alexa, Facebook is ranked at 3rd position when it comes to popularity, both globally and in the US. The average user spends 9:47 minutes on the website, and visits around 4 pages [4.01], Facebook has by far the highest number of sites that link to it- 7,601,185, in comparison to its rivals in the top 10 most popular websites in the world. Youtube is the second most popular and most visited site in the world. Youtube is owned and managed by Google itself. The site was created by three PayPal employees (Chad Hurley, Steve Chen, and Jawed Karim) in February 2005. In 2006, YouTube was acquired by Google for over $1 billion. You can watch and share every category of video on YouTube. The Alexa stats show the average visitor spends 8:25 minutes on it, and see approximately 5 pages [4.95]. There are 2,699,220 websites that link to YouTube. Apart from the US where the site is also ranked 2nd, same as it global position, YouTube gets most visitors from India, Japan, China, and Russia. Google is the most popular search engine as well as the most visited website globally. Currently, there are 1.17 billion monthly active Google users in the world. The site was founded on September 4, 1998 by Larry Page and Sergey Brin. Today, Google processes more than 40,000 searches in a second. Apart from its search engine the site provides a lot of other services – such as their popular email service – Gmail, and specialized searches through blogs, catalogs, videos, news items, etc. It also has social networking tools, organization tools, and chat tools, services for mobile devices and more. There are 3,560,046 websites that link to Google. The average daily time spent on the site is 8:01 in which the users view approximately 9 pages [8.93]. Google.com is ranked 1st most popular site in the US, 3rd in India in the same category, 2nd in Japan and 1st in Iran. ← WebHostFace Fall Special: Huge Discounts and Amazing Bonuses! Thanks for the wonderful post information above useful share and great list.